Eileen Dubin is in the front passenger seat. She is the Dekalb County Democratic Chairwoman. Steve Slack is sitting in the back seat and waving. He is the Dekalb County County Democratic Vice-Chairman and also serves as Chairman, Dekalb County for Obama Campaign. And in the back seat is another Steve; young Mr Jankowski is a member of the Northern Illinois University for Obama Campaign. Walking just behind the car in a dark vest and white shirt is Matt Duco, NIU Coordinator for the Obama Campaign. What a beautiful, warm, sunshiny day in my life! Sycamore is a beautiful, warm, sunshiny city near Dekalb with some huge old homes that reflect care and consideration. Everything was spotlessly clean and tidy. 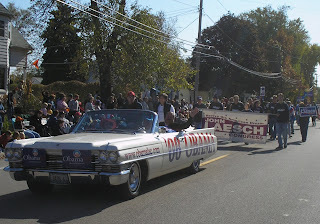 The people were warm and friendly, providing applause as the Obamalac rolled down their clean streets. And very, very few smokers were seen on the parade route. This picture was taken just before the parade started. On time! RESPECT-these kids have it. I was outside of Dekalb having a burger and sitting where I could watch my car and avoid problems from people who do not have RESPECT for other people and their property. They looked over the car but didn't get on it or in it. Most people have that needed respect, but there are enough who don't to cause some of us to worry too much. Thanks to these kids for bringing a needed smile to my heart this day! Obama in Washington. Iowa that is. Sen Obama with a smirk! No, just a camera angle. Virtually any picture that I've taken of him is great. Today is the 15 th anniversary of Michelle and Barack Obama's wedding and I'm sure they will have many, many more. When the two of them are together you can feel the respect he has for her and she for him. There is no doubt in my mind that she keeps him on the straight and narrow. The young lady to his right in the picture is today's host here in Washington, Kiana Scott. She and the staff were congradulated by the Senator for a job well done. I've seen her at several functions and her sincere smile and performance captures your attention and memory! Thanks from all of us who enjoyed the days event. I estimated there were just over 1,000 folks here on this fine day.